Our dog’s most exciting time of the day is walk time. It can be a little hectic getting three dogs ready to go out when they are just so full of enthusiasm. 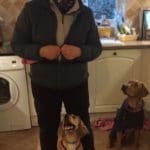 Wouldn’t it be nice if our dogs could be ready and wait nicely so that we can leave in a calm and focused manner, then be attentive to us when we are out? Sue Kewley Practice have been in business for many years and have countless satisfied customers. Click here to read testimonials from just a selection.